As a member you will discover things to inspire you all year round! Our programs are designed to provide you with the utmost access to our expert staff and the artists and performers visiting our campus. Your support makes our exhibitions, lectures, childrens activities, and performances possible. 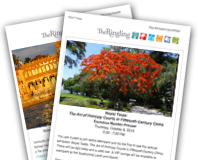 With your help, The Ringling will continue to be an inspiring resource for our community. Give a gift that inspires, surprises and engages all year-round. Our Membership Staff will dress up a Gift Certificate for you and mail it to the location of your choosing. Please allow 2 weeks for delivery of Gift Certificate and up to four weeks for delivery of permanent Membership Card. ► 15% discount at on-site Museum restaurants and cafés. ► 1 Member for a Day guest pass. * Includes dependent children, grandchildren age 18 and under, and college students. College students must present a current college ID along with the membership card of one of the designated Members. ** The childcare helper and children may visit by presenting ID along with the membership card of one of the designated Members. For donors whose Membership is paid through a donor advised fund, IRS regulations prohibit the donor, donor adviser, or the donor’s family member from receiving any benefit in excess of an incidental one as a result of the distribution. If this applies to your donation, please call 941-359-5821.